Now this is a fun and educational way to do some good. FreeRice.com is a English language vocabulary game in a simple, well-designed site. 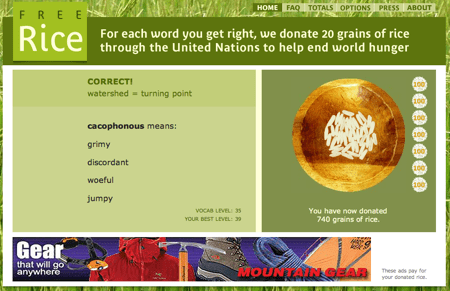 Click on the word definition, and for every answer you get right, 20 grains of rice will be donated to the United Nations World Food Program. According to the WFP website over 8 million grains of rice have been donated, thanks to the site’s advertisers who actually pick up the bill. The game adjusts itself quickly to your individual level, and then stays just a tiny bit harder than you need. Have fun. No cheating by sneaking up to the search bar!